April 14, 15 & 16, 1966. BD wrote: “When I saw this play some years ago in Brighton I found it so powerful and haunting that I knew I had to work with it at a closer and more intimate level. 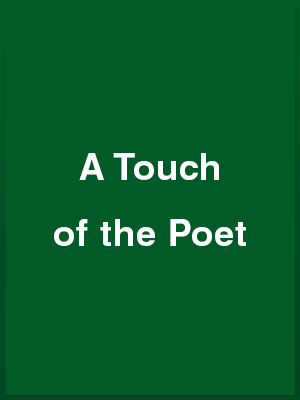 A Touch of the Poet in essence deals with the personality of one man, Melody, and it is O’Neill’s ability as an author to capture the basic truth of this personality which gives the play its appeal. TWO Lancing players will be in the cast of the Wick Theatre Company’s 50th production at the Barn Theatre, Southwick in April. The chosen play is Eugene O’Neill’s A Touch of the Poet, the story of Major Melody who fought under Wellington in Spain, then retired to Boston to run a pub and try to live the life of a hero and gentleman. The rôle of his former comrade Corporal Cregan will be played by Ray Hopper, of Cokeham-lane, and that of the drunken Irishman by David Goodger, a former acting member of Sompting Congregational Youth Club. Worthily marking the 50th full-length production by the Wick Theatre Company since its formation in 1948, at Barn Hall, Southwick, this weekend, is Eugene O’Neill’s A Touch of the Poet. Wednesday’s opening gala performance was before an invited audience, including the chairmen of Shoreham and Southwick Councils, members of both bodies and representatives of several drama societies, who after the final curtain were invited to meet the cast at a sherry party. There were public staging last [Thursday] night, there will be another tonight, and the final showing is tomorrow evening. This is a play which makes great demands on its principal characters, who at times come near to being drowned in a welter of words, most of them in a rich Irish brogue. It also calls for sustained acting running just about the whole gamut of human emotions, and the cast, under producer Betty Dawes, wholly justified their selection. The central character around whom the other players revolve as satellites is Cornelius Melody, a fine figure of a man living on his memories as an officer of Wellington’s in the Peninsular War, and now, nearly twenty years later, in 1828, reduced to running a tavern in America – with all the work done by his ling suffering wife, Nora, and their daughter, Sara. Barrie Bowen fully succeeds in portraying Melody with the stamp of realism – the vain, haughty Irishman who has come down in the world, contemptuous of the Americans who are his customers, looking for insults, real or imagined, and, after treating his womenfolk like dirt, given to brief flashes of remorse. Whatever the mood of the moment – fighting drunk, gay or in gloomy introspection – the character comes vividly to life. Betty Elliott’s contribution, of a women sticking by her man through thick and thin, seeing good in him even when it does not exist. Throughout her acting is quietly compelling. Sara, defying her father and very much a girl with a mind of her own, is played with a fine zest and understanding of her rôle, by Clodagh O’Farrell. It makes great demands on her, but she is more than equal to the occasion. There are able contributions by Ray Hopper as Jamie Cregan, a corporal under Cornelius in 1809 at the Battle of Talavera; Frances Moulton, as Mrs. Henry Hartford, with whose son Sara falls in love; Ralph Dawes as Nicholas Gadsby, a lawyer; and David Creedon, as Mickey Maloy. The cast is completed by John Wilson, David Goodger and Peter Power as three roistering Irish layabouts, who bring just about the only humour in the whole play. The tavern setting is particularly effective, for which John Perrett, must take the credit. Frances Thorne is stage manager, Frank Hurrell is responsible for lighting, Margaret Perrett for properties, Morfydd Bowen for the wardrobe and Terry Mase for sound effects – in this case a real contribution. Wick Theatre Company, surely one of the most polished amateur dramatic companies in Sussex, on Wednesday celebrated their fiftieth major production with a splendid interpretation of Eugene O’Neill’s A Touch of a Poet. The company turned their birthday into a gala evening. The men who showed you to your seat wore evening dress, a sherry party was laid on for everyone attending the evening, and if that was not enough to please the play itself was capitally performed. The choice of the play might seem a little over-ambitious to those who have yet to see the company in action. O’Neill, after all, is never easy to perform on the stage, and it must have been a daunting job to read out long speeches in a thick Irish brogue all the evening. But the players made light of this hurdle with a more than passable attempt at ‘talking the blather’. The play revolves around the Irish anti-hero Cornelius Melody [ Barrie Bowen], his long suffering wife Nora [Betty Elliott], and daughter, Sara, [Clodagh O’Farrell]. Nineteen years to the day, July 28, 1809, Cornelius was personally complimented by the Duke of Wellington for his gallantry at the Battle of Talavera. Not a day has gone by when his family is allowed to forget that occasion; not a day passes when he does not recall to his few friends his great wenching days in the army with the fine ladies of Spain and Portugal. And not a days passes when he does not remind Nora that he, a major in His majesty’s Army, son of a wealthy landlord, lowered himself to marry a poor peasant girl from the Irish boglands. Cornelius can only dream of his upstanding army days in the best Colonel Blimp tradition and, while he dreams and drinks, his wife has to run his horrid tavern. The man’s a failure, but refuses to face up to the fact, and Sara and her father have a slanging match all though the play because Cornelius will not face reality. Cornelius finally does accept what he has become – nothing more than a rough Irish immigrant – but there’s more to the ending than that. The whole company works hard, but a kind word should be said for the horse-playing three Irish layabouts, played by John Wilson, David Goodger and Peter Power. In a play of often savage emotions, their tomfoolery brings a nice touch of welcome relief. The play continues at the Barn Theatre, Southwick, tonight and tomorrow.